I weighed-in at a new low of 79.7 kg this morning. I’m still waiting for the “bread makes you fat” effect to kick in. Instead of buying a single huge loaf of blandness today, I picked up an assortment totaling 420g. This stuff is pretty good, especially the Raisin Walnut bread. I won’t have any problems finishing today’s challenge. Do people really believe that bread makes you fat? Yes, they do. 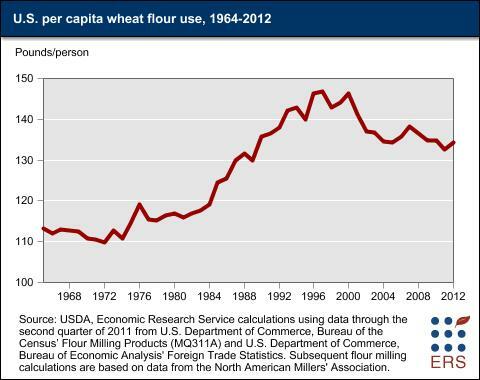 Market studies show declining US per capita flour consumption, a 10% decrease in bread and roll sales from 2006 – 2011, and so on, and so on. These declines are attributed to negative beliefs about carbs, as started by Atkins diet in the early 2000’s, and periodically resurrected by various fad diets. Of course, people still got fatter eating less bread. 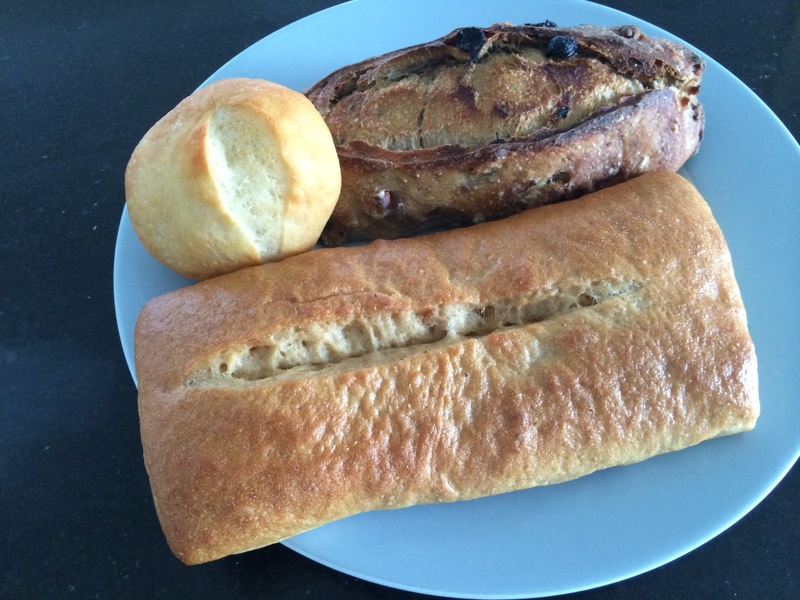 So why do people believe that bread (carbs) make you fat? I think people are disposed to this idea, because we see that we’re all getting fatter, and we have to blame something. Some people (correctly) blame fast food and junk food. Other people’s reasoning goes something like this: A) meat is superior to bread, B) we’re eating too much of something, so C) let’s stop eating bread (alternatively, “it’s the bread that makes you fat”). Or, the reasoning is something like, “eating meat will give me muscles”, “eating fat will make me fat”, and “eating dough will make me doughy”. People might believe that “carbs make you fat”, because we naturally believe in the potency of small ingested things. (Our survival selected for it.) We also believe in the efficacy of extreme diets. So, restricting yourself to < 40 g/day of carbs, and going ketogenic must work to lose weight. In the process, we all miss the point that eating a whole-foods, high-fiber, traditional diet (based on starch, a lot of vegetables, with some meat and fat) has worked for millennia. This low-carb silliness will never end. Their position has become intransigent, and they’ve developed Young-Earth Creationist type arguments about insulin spikes, calories don’t matter, Ancel Keys conspiracy theories, sugar is a toxin, mutated wheat, etc. If you tell them you’ve lost 25 kg eating primarily carbs, starch, and bread, then they’ll say about 1/3 of the population can tolerate carbs (but the other 2/3 must go ketogenic; there’s some magic -/0/+ quantum state in people). You can’t win with them. Which would be alright, except that the general population takes away the idea that “carbs make you fat”. Sometimes I get excited when I hear Paleo advocates encourage people to “eat real foods”. But then they’ll tell you that beans, peanuts, corn, rice, tomatoes, etc. aren’t real food (according to their magic-spell diet). And they’re absolutely terrified of bread. I added your blog to my list. I used to follow the Pritikin program, particularly when Nathan Pritikin was alive. I loved that way of eating. Now I am vegan because of health issues, particularly my cholesterol which might be genetic but it has come down and I feel terrific. I am a fan of Jeff Novick, John McDougall and Mike Greger. I just found your blog today and you might have already written about it; my question is, why aren’t you choosing whole grain breads? I think adapting your eating style to your personal circumstances is a good idea. I definitely enjoy all the talks/videos by Jeff Novick, Dr. McDougall, and Dr. Greger (he’s hillarious!). I thought I was going to eat whole grain breads, but soon found that gets very tiring when you’re eating a whole loaf everyday. I quit the challenge if I had to eat whole grain every day. But when I go back to normal bread consumption levels, it’ll probably be whole grain.